DO YOU EVER WONDER "WHAT is THE FUTURE OF FITNESS?" Should it be tough on the body, hard on the joints, high impact, etc.? We believe in longevity… strengthening the core, improving endurance, jump-starting metabolism, burning fat, increasing flexibility and restoring the body’s natural balance. 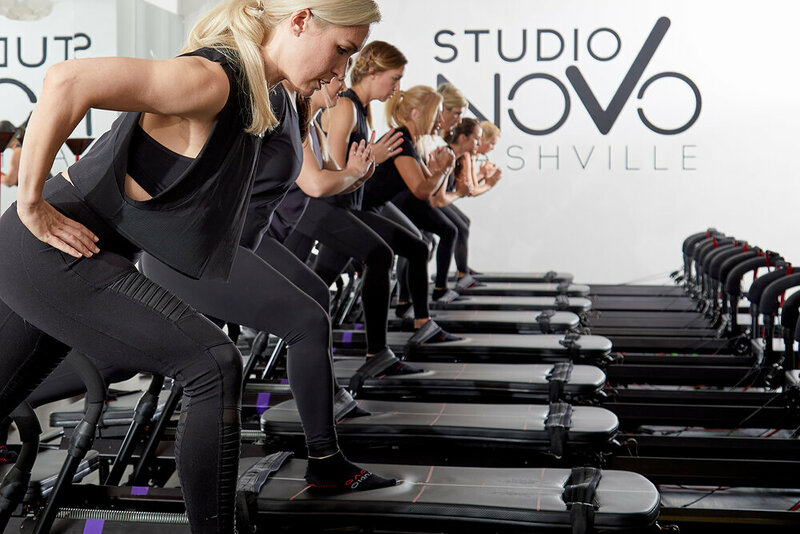 We invite you to be part of the evolution of fitness and join the Novo Community! Check out our Lagree certified trainers! Took a look at where the future of fitness is taking place. Our story of how we made to where we are now. Sebastien Lagree is the mastermind behind the Megaformer/Lagree Fitness method. He is a true fitness visionary as he designs, prototypes, manufactures and distributes his own equipment. He has transformed the healing and therapeutic Pilates workout into a unique fitness experience that results in significant effects on the body’s natural composition. Sebastien emphasizes the importance that Lagree Fitness™ is not considered Pilates. It is a unique and perhaps the only workout that effectively combines strength training, cardio, endurance, balance, core and flexibility not only in 1 session but in each and every move. Lagree Fitness™ allows for a maximum muscular effort while minimizing the stress on the joints, the connective tissues and the spine. Lagree Fitness™ is not revolutionary; it’s evolutionary! Fitness has always been a central component of Anna’s life. She’s been a life-long athlete, as a collegiate soccer player at Spring Hill College , a recreational tennis player and a dedicated runner. With fitness always being a strong passion, she decided to make a career change from the world of development and event planning into the world of fitness. She began to learn about the Lagree Fitness method and just couldn’t get enough. After learning about the effectiveness of the unique workout, she had to try it out for herself. After one class, she was blown away by the intensity of the workout and the day after, the amount of soreness. She found herself making excuses to go to Atlanta (the nearest city with a Lagree Fitness studio) and inevitably squeezing in a workout or two. Needless to say, she was hooked. It was clear that this method was the next big evolution in the fitness world and she is thrilled to be bringing this unique workout to Nashville, TN! Anna’s passion and deep understanding of this method allows her to teach in way that’s methodical, with an emphasis on proper form, while also providing her clients with energy, motivation and encouragement during each and every exercise. Santi has been an avid athlete all his life. He played tennis at the collegiate level, at Spring Hill College. He feels that having a healthy diet and active lifestyle is crucial to achieving balance and happiness. Santi is a SVP at Pinnacle Financial Partners in Nashville, but also shares a passion for fitness with his wife, Anna. After experiencing the workout and hearing success stories, he too fell in love with the method. Santi is warm, energetic and motivating, allowing for a fun, yet challenging teaching style. He brings a load of energy to each and every workout and he is excited to bring this new fitness concept to the people of Nashville!